In July, millions of Europeans called on the Members of European Parliament (MEPs) to vote down a proposal that would impose copyright filters on European social media, and create a new power for newspapers to charge or sue anyone linking to their news stories. The MEPs listened to that call, and in an historic rejection of the standard procedure, voted to revisit that language. Now they have a more complicated choice to make, and less than a week to learn how to make it. Next Wednesday at Noon CET, all 751 MEPS will be voting on 203 brand new amendments to the “Copyright in the Digital Single Market” directive, including genuine reforms as well as innocuous-looking language that would double-down on the copyright filters and link taxes from the previous, rejected, draft. If you’re someone who understands how the Internet works, and a voter in an EU memberstate – or you know someone who is – you may be those MEPs’ best and most honest guide to those amendments. Your voice will be up against a renewed lobbying campaign from the music and mainstream news industry, a conflicted and wavering set of Internet tech giants, plus a heavily-lobbied set of fake compromise proposals. But the odds are better than they were in July – and we won then. We just have to win again. Here’s where matters stand with 6 days to go, and what you can do right now to steer Europe’s Internet away from the IP iceberg it’s heading toward. A large part of the European Parliament’s job is to revise – and hopefully improve – proposals that come to it from the EU’s other branches of government: the European Commission and European Council. The “Copyright in the Digital Single Market” directive unfortunately started bad and ended worse, including language that would require compulsory copyright filters (Article 13), and a wide new power for news media to license and control the text of links to their news stories (Article 11). Most of the language of these proposals had been pushed in Parliament by MEP Axel Voss through the JURI subcommittee. On July 5th, the Parliament agreed to reset the text back to its original proposal, without the Voss amendments. A vote on a new set of amendments, open for any group of MEPs to suggest, was scheduled instead for September 12th. The deadline for these new amendments was just a week before, on September 5th. This Thursday was the first chance MEPs and their advisors had to look at over 200 new proposals to the original European Council/Commission text. The faint hope that Axel Voss would hammer out a reasonable deal with his critics faded when he announced his “compromise amendments” to MEPs last week. Just as previously, when Voss claimed he had fixed the problems with his plans by pasting in clumsy exceptions for “online encyclopedias” and “open source code-sharing sites” (Wikipedia and Github weren’t convinced, and still lead the charge against Article 13), Voss’s changes look friendly, but do little. This time they will make Article 13 even worse. 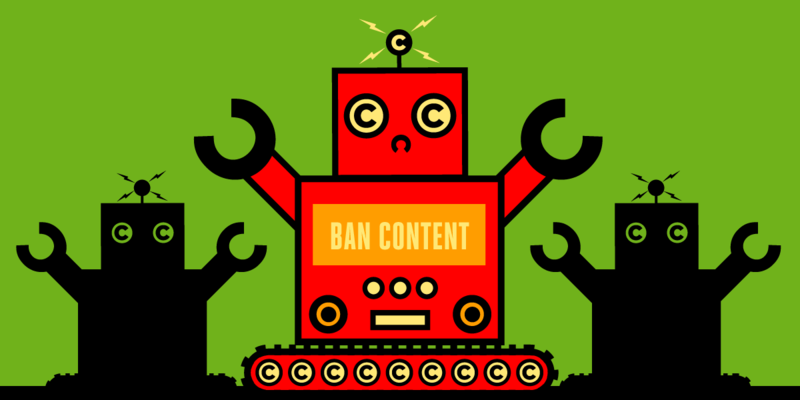 The new Voss amendment on Article 13 no longer includes an explicit mention of copyright filters – it just makes it impossible for any community content-sharing website to survive without them. In fact, most sites would struggle to stay legal even with their user filters turned up to the max. Without prejudice to Article 3(1) and (2) of Directive 2001/29/EC, online content sharing service providers perform an act of communication to the public. By defining the sharing websites themselves as “performing an act of communication” (rather than their users), this language strips away existing liability protections websites have if their users are accused of copyright infringement. From remixes to memes, sharing sites would suddenly be liable en masse for all the errors in rights management committed by their users. The rest of the new Article says that the sites can be saved if they pre-emptively negotiate licenses for everything they show. Which means that they might be saved from being sued by the major music labels and Hollywood studios, as long as they put up perfect copyright filters – but they will still remain liable for any other suit. Far from being an improvement, the change makes bad language even worse. There are more fake concessions in Voss’s Article 11 amendment too, which now says “individual words” can be used to link to a new story. That’s language that nobody opposing the link tax thinks improves the proposal, and only exists so that Voss can claim that you’ll still be able to use your own text in a link to a news story – as long as you create a hostage-letter-style cut-up that doesn’t accidentally quote two consecutive words from the article. The Articles should be deleted from the text completely. That's already the position of European-sceptic groups on both the left and right. Barring a travesty in the voting process, MEPs will be able to vote both for deletion of the articles, and then the Reda/Schaake amendments on September 12. The complete deletion amendments will go first, and then if each fails, the MEPs will go on to vote on more detailed language changes. We are encouraging all MEPs to reject Article 13 and Article 11 entirely. This is a vote for the status quo as it has stood for nearly two decades, supported across the political spectrum, and from all sides of industry – far from an extreme stance. If the votes aren't there for deletion, the Reda/Schaake amendments are the best fallback. "Thirty-five years of experience in the music industry lead me to believe that this directive would be a net negative for artists, for the industry and, ultimately, for the public good." Next week the various parties and pressure groups will be writing up a more detailed set of voting lists on all the amendments – including the other articles of the directive, such as those on data-mining, that we’ve barely had a chance to touch upon. For now though, you should already know the direction the EU should take on the most infamous parts of this directive. Call your MEP now and if you know others who are residents in the EU, tell them to call or write to their MEPs too. You can find info on each of your MEPs on the SaveYourInternet.eu site, or on Parliament’s own site (just click on the maps). If you’re outside of Europe, please consider sharing this blog post with your European friends and family and let them know that this is a red alert. We have just days until the vote. Tell them to reject the Voss amendments, and reject Article 11 and 13, reject copyright filters, and reject ancillary rights on press snippets. Encourage your MEP to choose options that avoid filtering uploads or restricting links.